Next Thursday, the Lipscomb doors will be quiet and dark as we disperse to warm, cozy homes filled with cornucopias and pumpkin-scented candles. Some of us may just be looking forward to the comfort of our own bed, the chance to shop til we drop on Black Friday, and the opportunity to spend time with family and breathe for once, escaping from the everyday stresses of college for a little while. But most of us girls have one stress on our mind — what to wear to Thanksgiving dinner. I often think about why we spend so much time dressing up to eat with our families when it’s something that we have done thousands of times throughout our lives. Tonight one of my friends explained the logic of it to me. “You’ve got to look your best and show them how great you’re doing when they ask you how your life’s going,” she said. And it’s the truth. 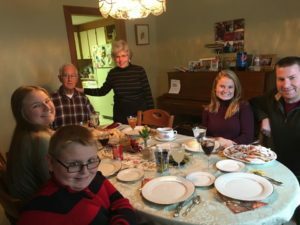 Perhaps the reason that we spend so much time focusing on what to wear to the dining room table is because we want our relatives to see that we are thriving: that we are put together and still rocking stylish outfits (when in reality it’s leggings and tees to class all day, every day). Still, though, we want to look cute (I know I do) for the hundreds of pictures my sweet grandmas will be taking of all of us together. Might as well look pretty in the photos if they’re going in the frames or on Facebook. Therefore, here are some tips for how to dress your best for Thanksgiving dinner. 1. Fall colors are perfect for the holiday. Go with a maroon, mustard, olive green, dark orange, navy, cream or brown. Combine some of the colors in your look, if you want. TJ Maxx has plenty of cute tops and dresses in these colors, and I know other stores do, too. 2. Try a long sleeve top or sweater. Try to find one of these colors in a cute long sleeve top or a soft sweater. 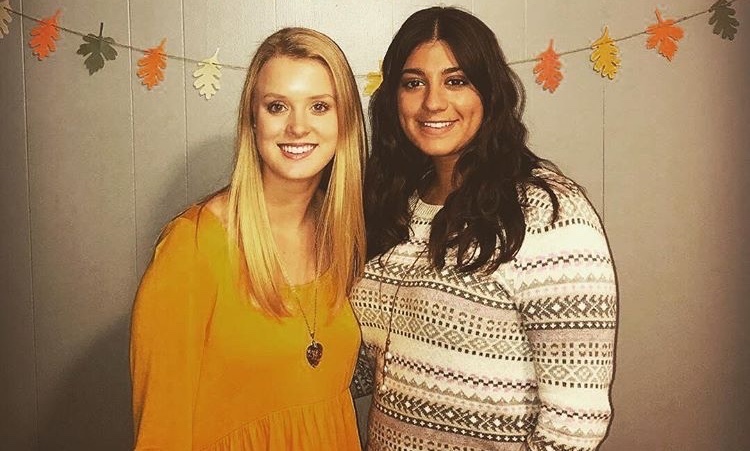 I know I sound cheap (I am a broke college student) but Walmart has some really cute fall sweaters right now that are super soft and comfy. And they’re only $9.96. Just putting that out there. 🙂 TJ Maxx and Marshall’s also have a great selection. 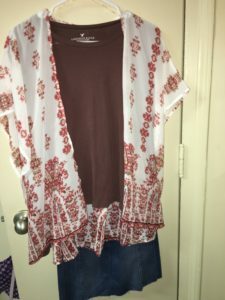 I found a simple American Eagle long sleeve chocolate colored top and paired it with a cream and red kimono for an adorable fall-look. Holding it up to my mom and aunt in the store, my aunt even said I was such “a little fashionista” as I put outfits like that together as I shopped. 3. Go comfy on the bottom. You don’t have to wear a tight itchy skirt if you’re not going to be comfortable! Thanksgiving dinners can last a long time, and you’re going to be in that outfit for the entirety of the day, so make sure you’re comfortable. For me, I find myself feeling my best in a breathable skirt — usually cotton — but also love my corduroy and jean skirts, too.If it’s going to be chilly where you are, make sure you layer up with a cute pair of tights or leggings underneath, should you choose a dress or skirt. You don’t have to go with one of those, though. Jeans are just fine if you accessorize or dress up the top, and I even think a dressed up pair of colored joggers could work, like these for $35 at Forever 21. 4. Don’t Over-Accessorize. Keep it classy and simple, with earrings like pearls, and maybe a necklace or bracelet or two. Don’t go too crazy, though. You’re trying to look impressive, not too showy. 5. Keep the Makeup Simple. Your family has seen you through it all. They are not going to judge you if you do not wear a face full of caked-on eyeshadow and pounds of blush. Go for a natural, glowing look with a little bit of mascara and subtle eyeshadow. Just be you — your family loves you for it, I promise. With these tips, I hope you’re able to find an outfit you love that you can wear as you surround yourself with love, laughter, and lifelong memories this Thanksgiving. You’re going to look beautiful no matter what you choose, and despite what you may think others think of you, you are doing great. You are thriving and surviving college and you should be proud. In all honesty, Thanksgiving is not about trying to impress others. It’s about being with those you love and cherishing all that you have. So why are we so focused on how we look to others? Just remember that you are loved for exactly who you are, and to take this break to spend time with those you care about most. Recognize how blessed you are for all in your life, and enjoy every little moment you get to spend with family and friends this holiday season. Stay safe, have fun, and keep being fabulous you. Happy Thanksgiving.